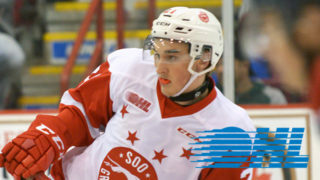 Minus three veterans including their two leading scorers (Boris Katchouk, Morgan Frost, Noah Carroll), the Soo Greyhounds put in a solid effort from top to bottom of their roster on Friday Night to not only extend their winning streak but increase their lead at the top of the OHL standings. The Greyhounds scored first and never trailed before picking up the 3-2 overtime win over the Kingston Frontenacs. 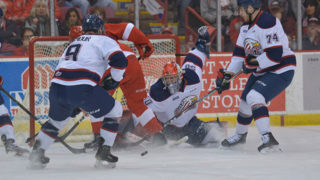 That allows the OHL leaders to sweep their season series with their East Division opponents. “You said it there. Character of the kids came out. We competed hard, we played really well, I thought we dominated the game for most of the game. Just the pace we were playing with, the energy we played with. Certainly showed a lot of character and if it wasn’t for Helvig in the first period that came could have been out of hand early” commented Head Coach Drew Bannister when asked about his team’s character. “It’s one of the better games we played, I thought we played outstanding. The energy we had, the way we competed was good to see” he continued. The team’s 22nd victory of the season also put them among just two other team’s in the franchise record books. It mark’s just the third time the Hounds have extended a winning streak to thirteen games in franchise history, the first time since 1985. It was during the 1980 season the Hounds first accomplished such a feat with a roster featuring the likes of Ron Francis, John Goodwin, Steve Gatzos, John Vanbiesbrouk,Tony Butorac (Oct. 24/80 – Nov. 19/80) before accomplishing it again five years later (Feb. 1/85 – Mar. 8/85) with Wayne Groulx, Bob Probert, Mike Oliverio, Graeme Bonar. But on this night, if not for the goaltending of Kingston’s Jeremy Helvig, the Hounds would have hit the board in the opening frame, but would have to settle for a scoreless draw after outshooting the Frontenacs 19-2. Scoring would open 8:55 into the second period when ANTHONY DEMEO’S point shot first hit the stick of BARRETT HAYTON and then was finished off by KEEGHAN HOWDESHELL for his 6th goal of the year and a 1-0 Greyhounds lead. An odd-man rush saw Jason Robertson’s cross ice feed finished off in by Linus Nyman at the backdoor under three minutes later to even the score 1-1 after two periods of play. The Greyhounds retook the lead in the opening minute of the third when HAYDEN VERBEEK outpaced Kingston down low setting up COLE MACKAY who would backhand home his 4th goal of the year and the Hounds were ahead 2-1. Two-and-a-half minutes later a 2-on-1 developed where Robertson moved the puck from MATTHEW VILLALTA’s left to right, and Nathan Dunkley deposited home his 10th of the year to pull even Kingston for the second time in the game. 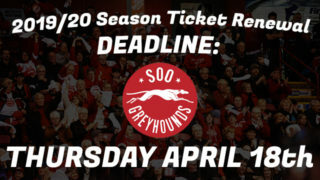 In what was a good-paced, tame affair, a penalty call against the Hounds came with just twenty-six seconds left in regulation putting the Hounds shorthanded for just the second time on the night. The visitors gained at least a point by getting through regulation and moving on to overtime. 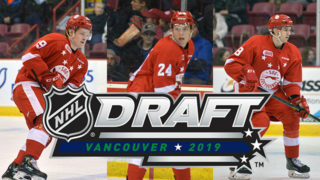 In the extra session, the trio of HAYDEN VERBEEK, TIM GETTINGER and CONOR TIMMINS countered the Kingston man advantage to get their team back to even strength. “They were in the shooting lanes. 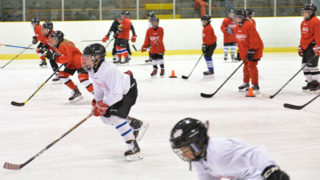 They were able to get their sticks on pucks and kind of break up plays. And when we needed a save, Matty made it. It wasn’t really scrambly,. You could tell they were getting tired but they did a real good job not getting themselves out of position” said Bannister about his team’s PK work in overtime. Seconds after the Hounds were back to full strength Kingston was assessed a minor and the powerplay would take just seventeen seconds to produce the game winner. 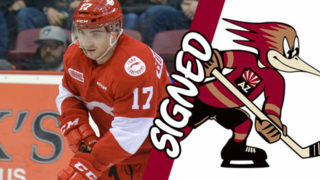 CONOR TIMMINS would fire high overtop Helvig for his 6th goal of the season and 4th in the last three games to keep the Greyhounds winning streak intact. The win improved the Hounds to 22-3-2-0 on the season, good for 46 points and now a three point lead at the top of the overall standings over the Sarnia Sting. After an off-day on Saturday, the Greyhounds will conclude the road trip against the Ottawa 67’s. Game time from TD Place is 2 PM. Fans can hear all the action beginning with the Soo Video TV Pre Game Show starting at 1:35 PM or watching live on ShawTV at 2 PM.